Bees are some of the first livestock the Sow’s Ear acquired. 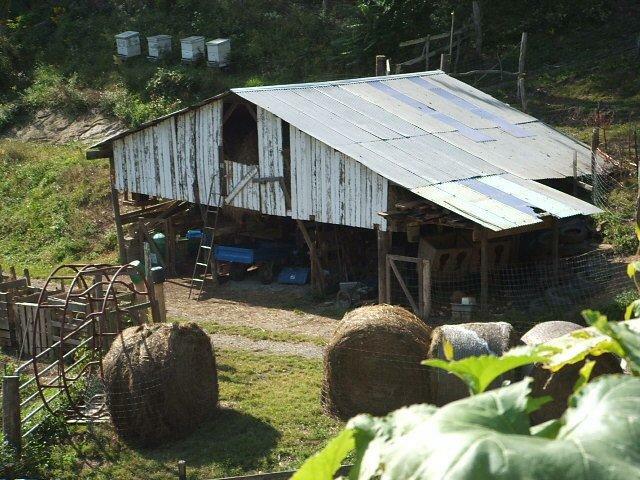 We started with two hives, and have always, even in the worst years, had at least one living colony. Bees do not live individual lives; they are not capable of an existence separate from the colony. Hence the beekeeper raises, not bees, but communities of bees, which live, prosper — or not — and die, according as their queens live and die. Like any animal, they may succumb to disease, neglect, or old age; they may stray, and if they do, they may never be found again. Hence, every summer that finds us with colonies in the hives means, to us, another successful year of beekeeping, regardless of how much honey we may, or may not, have harvested. As long as we have bees, we are beekeepers. That said, we are very much hands-off beekeepers, taking only as much honey from our hives as they seem able to spare without going short themselves. With commercial honey at over four dollars for a ten-ounce bottle, their produce is some of the most valuable the farm affords. Three of the four hives we overwintered are active now on sunny days. Nothing but coltsfoot seems to be blooming, and not much of that, so we are feeding them sugar water, making it available in galvanized water dishes of the kind you screw to a small-mouth mason jar. Usually they are for chicks, but the bees don’t seem to notice that we are using morphed equipment, and even the flies and wasps that seem to spontaneously generate on warm days lap up the beefood without concern. Occaisionally one of them is trapped in a rising bubble pulled into the inverted jar, preserved there like fruit in a conserve. This is on the warm days only; mostly we are still wearing coats out of doors. The clear skies and more direct sunlight fool us into thinking that it’s really spring, but the bees are wiser, and most days they stay in the hive, eating honey stored last summer and waiting for a real change in the weather. April: We have been in the hives a number of times now. They all seem to have active queens with good laying patterns, and are strong colonies, with lots of workers in the hive and in the field. We are seeing cells of white sugar around the edges of frames of last year’s honey, which means we did not need to feed syrup when we did this spring, although the bees did seem to need pollen, judging by their taking dust-baths in the ground corn the pigs spilled. Next year, if our record-keeping is our guide, we will open the hives and look around before feeding sugar syrup; such feeding is intended to stir the bees to action, but was almost certainly unnecessary in the light of all the honey they still have from last year. We took five frames of old honey out of hive #1, and now the boys can have honey on their biscuits, should they tire of applebutter. May 8: We got into the hives and determined that all three queens are laying in nice patterns — that is, there are large patches of brood and capped brood — and that there is still brood in the bottom hive body of #1, so we can’t yet take that box. Once the brood is out of there, we’ll drop them back to two hive bodies. Queens move up as they lay, so we can be confident that no more brood will be put in the bottom box for now. These hives are very strong — they have lots of workers — so we will be looking at making splits in a week or two. south of Fort Morgan, CO.